An expert and clear resource filled with highly effective `recipes` of easy to follow steps for those at all experience levels. 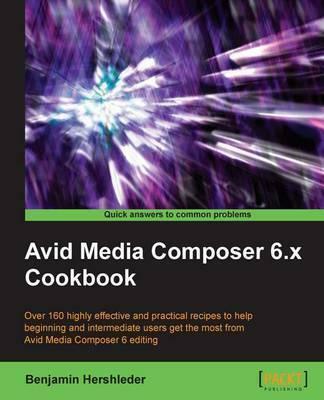 Gain Avid Media Composer (and Avid Symphony) essentials and far beyond, including techniques, tips, tricks, and helpful explanations not found in other publications. Its 435 page task-based approach, and three informative appendices, will help editors at all experience levels gain a deeper, more thorough understanding of the software. The book is designed so that you can read it chapter by chapter, or jump to a specific `recipe` when needed. It will greatly aid in achieving mastery of the professional editing features that Avid Media Composer offers. You’ll learn not only how to perform a task or editing operation, but also why and how it works, in addition to what situations it’s useful. Gain exposure to options and methods that you never knew were available. The step-by-step recipes are packed with practical examples of time-saving tools and methods to get you working faster and more confidently so that you can spend less time dealing with technical and operational issues and instead focus on being creative. Learn multiple methods of mixing audio, how to make and use Multichannel audio clips, how to use The Audio Suite, and how to take advantage of the new Real Time Audio Suite (RTAS) Plug-Ins. Benjamin Hershleder (Hershleder.com) currently freelances as an Avid editor and a director. He has been teaching Avid Media Composer since 1995, and became an Avid Certified Instructor in 1997. He teaches as an adjunct professor at the American Film Institute in Los Angeles, at “Avid Authorized Training Partner” institutions, and also provides private, customized training to individuals and facilities. Hershleder’s credits include directing and editing the feature length documentary \"The Bronx Boys Still Playing at 80\" (Hosted by Carl Reiner) for Shapiro-West, editing the feature length comedy concert \"The Original Latin Kings Comedy” (George Lopez, Paul Rodriguez, Cheech Marin) for Paramount Studios, and editing numerous hours of television for the E! Entertainment and Style networks.